One of our food columnist's recommendations merges sushi rolls with jelly rolls. Vancouver may be awash in gelato spots and macaron shops, but if you're looking for a different way to satisfy your sweet tooth, On The Coast food columnist Gail Johnson has you covered. Johnson says Vancouver's multicultural dining scene is building a reputation as a place for all sorts of delicious desserts. 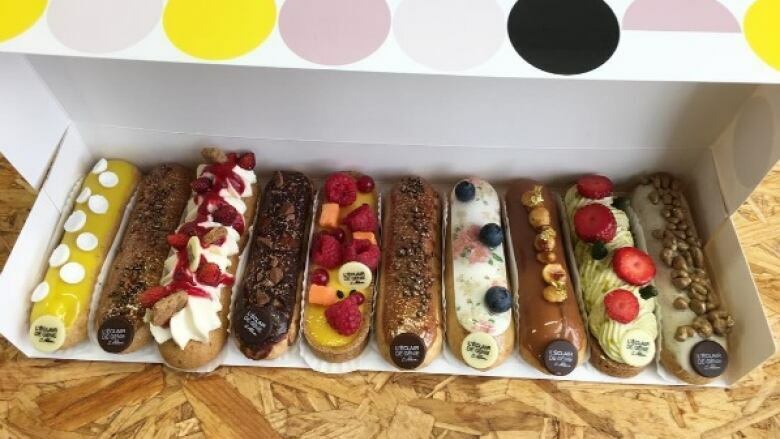 One of those places is a new French pastry shop, l'Eclair de Genie, the first North American location of the Paris-based bakery. "These are lavish, gourmet works of art, absolutely beautiful to look at," Johnson told On The Coast host Stephen Quinn. "They don't look like the lesser grocery-store varieties that look like a hot dog bun sliced in half with whipped cream in the middle. These are exquisite pastries." The shop has about 250 different types of pastry in its repertoire and about a dozen or so available daily. For the store's launch, they have matcha cream, white chocolate, lemon yuzu cream, maple cream and salted caramel. Johnson also recommends a new Japanese bakery and café called the Baker and Table. "Some of the standouts include "melon pan," which is an extremely popular round, sweet bread in Japan," Johnson said. "It's made with cookie dough on top and bread dough on the bottom." The shop also makes several different types of maki in flavours different than you might come to expect from a sushi place: blueberry oat crumble or roasted potato and cheddar, as examples. Finally, Johnson also suggests the Pie Hole, a place with a name that sums up its offerings pretty well. "The pies are made by hand by owner Jenell Parsons. She started out selling her stuff at local bakers' markets and farmers' markets, ultimately opening her own shop just a few weeks ago," Johnson said. "You can find meat pies at the Pie Hole, as well as a rotating selection of sweet varieties, many of them vegan. Depending on the day you might find banana cream, key lime or salted caramel apple pie. They're made with an all-butter crust." There's one called the Fat Elvis: a layer of dark chocolate ganache and then a layer of banana cream topped with a peanut butter mousse drizzled with caramel, roasted peanuts and more chocolate ganache.